We begin again in our Final Ascension of the 260-day Tzolk’in round. The Star/LAMAT trecena is the final trecena of the “Dark” – an Ascension of Consciousness that will be born from the Wisdom of a personal experience. 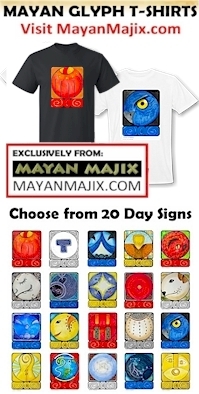 The Tzolk’in is a Gift given through the Maya as a path that Awakens the Divine Consciousness of Human Being. We were born to Know that the Divine Spark of Knowing that was shared with us was given so that we could realize our own Power as a Divine Creator. The Maya were special and are still special in their Gift of Consciousness – Knowing the Oneness we all share as part of Every Living Thing. Through their Wisdom, a way was offered for the Whole to discover the Divinity within our Self. Being there in the Yucatan was an experience of Oneness with Mother Earth that was magnified to abundance. The Time and Place was created from Love that is Eternal, manifesting a “forever Moment” we could always return to in Spirit. The journey was a manifestation of a Dream that could only come true with a Miracle. Knowing You shared my dream offered a Meaning and Purpose beyond myself. A Dream we manifested together, holds the Promise of Blessings to the Whole as the Sacred Exchange for our Faith in Believing. The Star/LAMAT trecena holds the Intention for us to claim all the Miracles that have been One in the Whole Transformation of this Tzolk’in round. LAMAT will help us gather all our Miracles together to manifest the Blessing of our Highest Ascension of Believing. The Blessing was promised from the beginning, IMIX, that we could become ANYTHING our Heart Desires. The Guardian of our Final Season of Transformation is 13 Sun/AHAU, the Ascended Light of the Creator, who intends a Revelation of our Unity of Consciousness. This is the Ascension we Dreamed of, which through many smaller Miracles, has created a whole new Vision of our Self and our own Power to Create the realities of our Experience of Life on Mother Earth. 6 Reed/BEN – We will Ascend to a new Rhythm and Flow of Creation, as a Channel Opened to Experience our Communion with the Creator. 7 Jaguar/IX – The Jaguar Spirit we held faith in Above, will be Divinely Balanced in the world Below. 8 Eagle/MEN – On the Holy Day of the trecena we’ll be lifted by Divine Intervention to See our Highest Dream, the Truth of our Own Spiritual Vision and the Guidance of Divine Intuition that carries us there. 9 Wisdom/CIB – Our Highest Transformation is completed by the Wisdom from an Experience of our own Creation. We will Know the Truth that we were Central to the Manifestation by our own Intentions, and Created by the Key of Forgiveness shared through the Inheritance of Wisdom that was Preserved for us by the Ascended Humans that came before. We will be Transformed by the Knowing that the Dreams we manifest are Creations Shared by the Whole. Everything you focus on for the Next 13 Days Will be Multiplied to Abundance! LAMAT is a symbol of Venus, the Brightest Light, only second to the Sun, that can be seen by Human – and like the Sun, generates its own Light. LAMAT reveals to us that we were created as a Personification of Light. From a Divine Spark of the All-in-One we were intended to become a Light Unto our Self. We will rise as the Evening Star that shines in the Dark, for the Revelation of our own Light. LAMAT’s totem, and the Cherokee Day Sign is the Rabbit, a cauldron of creation through its Love that Overflows. Through the Earth Magic of Gratitude for all the Abundance we can See, we hold the Power of Instant Manifestation. The Rabbit guides the day of “pure luck” when whatever we focus on will be Multiplied to Abundance. As the leader of this trecena, this Abundant Power of Multiplication will be operating throughout the next 13 days. The Eagle showed us that the way to focus on our Highest Hopes and Aspirations, believing in a Power Higher than our Own Inspired the Dream that will come true. If we can see it, we can grasp it. We were prepared by Deer/MANIK for a Transformation that requires our Highest Application of Vigilant Consciousness. We were led by all the Day Signs who shared their perspectives and ways to accomplish our most Potent cycle of a Life-Changing Transformation. How closely would you pay attention to your thoughts, if you knew that every thing you imagined was instantly multiplied? That is the effort of our final climb of Spiritual Growth. The Star/LAMAT trecena was offered for our crowning achievement. The outcome will depend on how we navigate our final journey. We’ve been guided to employ all our Spiritual Tools and many different perspectives. We were offered a Spiritual Tool from 20 different perspectives of the All-in-One. We can use them to hold the thoughts of our Dream and to Stand in the Truth that the Creator is Dreamed the fulfillment of our Highest Dream from the beginning. Star/LAMAT resides in the South, the Direction of our Relationships with one another and with the Natural World. The South represents the Element of Earth. Our Highest Transformation will be a Truth revealed through our relationship, with the Whole as One with Mother Earth. We created our own Web of Life, suspended in mid-air, strong enough to hold the memory of every Miracle. Not all spiders create the orbital beauty of Sacred Geometry. Only the orb spiders. Scientist compared and found one web to be as functional as another. They thought if the orb was the “best,” then all spiders would have adopted it. So, there’s nothing but a Miracle to explain why orb spiders choose to create such a thing of Beauty. Maybe the orb spiders are ones that most love the work. Sacrificing our Dream of a new world into the Creator’s Hands, it can be perfected in its most Beautiful Manifestation. The Creator wanted to have a Hand in our Creations and will Love the work of the finer details. May we Believe in the Beauty of Divine Will. We can begin with an Intention to see the Beauty in Each Other, Seeing and Acknowledging a Spirit that is always Conscious of Love. We can remember that beneath every Human exterior is a Dream of Love they long to Believe in. We can Remember that Spirit was the First Real Creation, and all the rest come from the Imaginings of the Human mind. 13 Sun/AHAU promises a Revelation of Reality through a Divine Illumination. We can Believe that a world imagined by Human Beings, can always be Imagined Again from a Brand New Beginning. We can look to the Future as Eagle taught us to do, Believing in the Highest Hopes known to our Spirit. We could employ the strengths of ALL the Day Signs in this trecena. We could use Them as our Spiritual Tools by remembering the threads of Wisdom they wove into our tapestry. We can remember how much easier it is to Imagine the Dream when we Believe. Just as the Bride can think of nothing else but all the details of the Wedding, just as a Mother can think of nothing else than the child in the womb, we can use our Vigilant Consciousness to imagine the Divine Gift that the Creator has in store. We won’t rely on Human eyes, but the Truth we stand on in our Heart. Star/LAMAT reflects our Highest Purpose to be a Star that shines its own Light. We found our own Light in the Darkness. Risen as the Morning Star, we’ll realize we are bright enough to be Seen next to the Sun. The Rabbit’s energy is all over the place. Our own thoughts may be all over the place. We can ask Now for the Divine Intervention to carry us through. We can Plan Now to Forgive, to guarantee we will “clearly see” the Truth. We can use the “Earth Magic” of Gratitude and the Atonement of an Offering to Pay Back and Pay Forward Now, the Miracle of Love from the Beating Heart of Mother Earth. Tone 1 is a day that offers the Light of Divine Inspiration. We can share our Light through a Prayer of Sacred Movement. Human Receives through the left hand and Gives through the right hand. We can place our right hand over our Heart and reach toward the Creator’s Light to Receive a Blessing to the Heart. In an equal and opposite way, we Direct the Love we’ve Received from our Heart to the Whole. In a “Leap of Believing” may we Celebrate Now the Miracle that is promised by 13 Sun/AHAU. Our final journey is the Labor of Love. May we be like the Mother that Loves “before we were born,” laying out the clothes, preparing the nursery, and imagining the Divine Moment when Love is placed in her arms. One of my first experiences of Spirit in the Yucatan was to hear the Beating Heart of Mother Earth. I was observing the Stars shining in the darkness over the beauty of the water below. All other sounds faded to the background and all I could hear was the rhythm of the water moving back and forth to the shore, and the Wind moving in harmony, as One Sound of Mother Earth. I wanted to listen for it again when I returned home, to see how She might sound as the Wind and Rain through the Trees. The Intention was forgotten until now. Now is the Divine Time to use this Gift. We can ALL listen for the Sound of the Mother together. Our Spirit will discern the Love that eyes can’t see. We can make a plan to See, Hear, and Acknowledge Her in the stillness of morning and night. We hold an endless supply of Spiritual Tools. Loving Earth and Loving Each Other can only lead us to a Divine Destination, and the Highest Revelation of the Truth that we are all One. May we reach for our Highest Hope the One Spirit of us ALL is always Consciousness of ALL the Love on Earth. To all my relations, may we proclaim in Vigilant Consciousness that every experience will be Sacred in its Purpose. May we see the Light in every experience. May we Hold the Joy of Knowing that no matter how things look on Earth, a Higher Power holds the Authority to lift us above it. What we can’t Love, may we Offer up for the Blessing of Divine Love from the Whole of Mother Earth. May we remember that when we reach the limit of our Human power, it’s not a failure, but only the Sign to the Creator that we’ve given everything we had to give. When we fall to our knees in failure, may we mark the very Time and Place where Miracles of Divine Intervention begin. May we do it all as an Offering of our Highest Effort of Unconditional Love for each other. May we initiate our Self into our Highest Application of Consciousness, gathering the resources of everything we’ve been transformed to believe. I’m intending to Believe in Miracles for You and Me that are bright enough for Human to Clearly See and Acknowledge. May we Dream that will Awaken our Newborn Spirit. May we be born Loving the Work of turning Darkness into Light. A Way Opens Before Us. All Obstacles and Impediments Are Removed. Only that which is Worthy and Desirable Moves Forward with Us. SPIRIT TALK: Some Humans believe that the theory of evolution is counter to the Belief of a Divine Creator. Yet, this is exactly how dreams evolve. They all start from one Spark of an idea that we spin into the Whole of the Creation – multiplying ideas to abundance. We weren’t created to be identified by our Humanity. We were identified first by Spirit, a single Spark of Consciousness that could multiply itself to Infinity. Who’s to say that Mother Earth wasn’t populated from the first Spark as the smallest living things there are. What Divine Idea held in the Mind of the Creator would be discarded in the manifestation of a dynamic creation that was born with a Beginning and an End? Human can see Love in living things smaller than itself. How big does a living thing have to be to hold a Spark of the Creator’s Love? *Native American Blessing – This was a farewell blessing after my 3rd Sun/Moon Dance, given to me by 3 of the Elders in the Medicine Circle. They spoke the blessing together with arm gestures (opening the way, sweeping the unwanted across and away, and then drawing forward the blessing). It was beautiful. You can design your own movement. I once spoke this blessing every time I got in the car, or going somewhere that I wanted to stand in my truth. Now I can experience it again, from a Higher Perspective.